Elizabeth Fay wearing a silk shirt, the material for which was sent from Egypt. George Fay, senr., and his wife Frances (nee Wakeford) took up land near the Creighton's Creek in the very early days of selection activities. The couple died when their children were young. They had three children - George, Frances and John (Jack). George married Elizabeth Sharp, of Longwood, and they reared six children, namely Reginald, Bernard, Harold, Laura, Edward and George. They built a home and lived on the Creighton's Creek property. 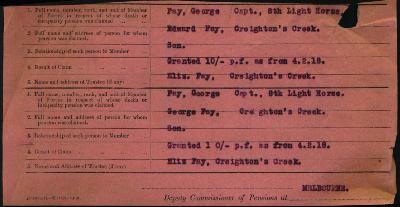 George was a member of the Rifle Club, the range being in one of his paddocks. He was a member of the Light Horse and served in World War 1. He attained the rank of captain and was killed in action. (I have seen a pair of cuff links sent from. Cairo to Joe Fay by his uncle, Captain George Fay). Jack Fay married Edith Sharp, of Longwood, in 1908. They also built a house on their property at Creighton's Creek. They had four children - Martha, Veronica, Joseph and Frances. He was also a member of the Light Horse (known earlier as the Mounted Rifles) and enlisted with the forces which went to the South African War. 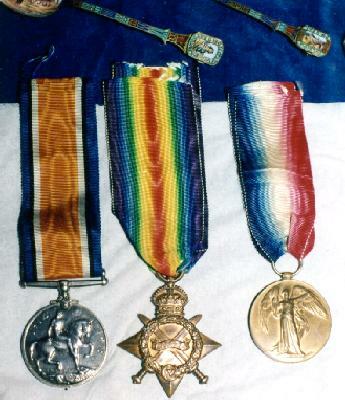 (1 have been shown a South African war medal bearing the following words: South Africa - Transvaal, Orange Free State, Cape Colony and also a likeness of Queen Victoria; also a South African War medal presented to Jack Fay in appreciation of his war services by the residents of Longwood). Jack was a keen rifle shot and won many prizes and trophies. He was a good runner and high jumper and won numerous events at district picnics. He was a member of the school committee for several years and he and his wife helped in all district organisations. Edith helped with knitting, etc., during two World Wars. 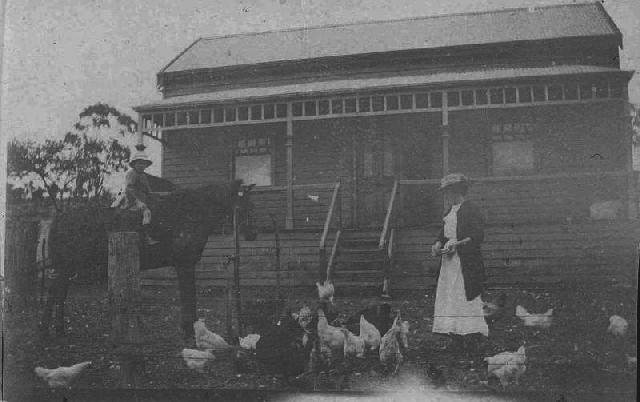 Jack and Edith carried on the farming activities until advancing age made it necessary for them to retire to Euroa. Frances Fay married Robert Gray, of Rochester. They farmed a property on the Campaspe River which is still being run by their son and daughter. 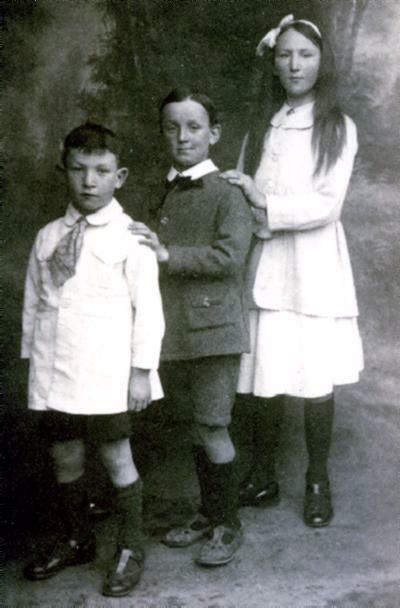 They had the following children - Edith, Betty, Francis and Robert. 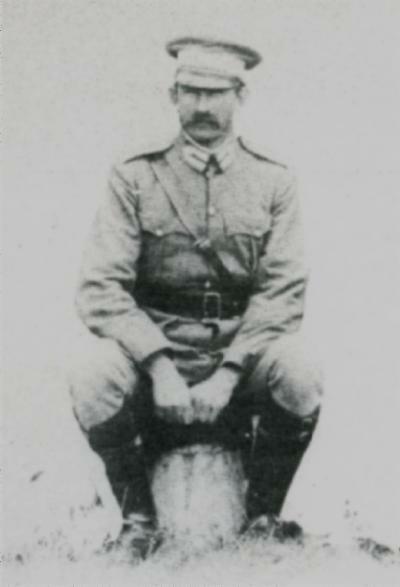 Captain George Fay, Second Lieutenant, 16th (Indi) Australian Light Horse. The senior Fay couple, George and Frances, died when Jack was eight years of age. The property was then put into the hands of trustees until Jack was 21 years of age. George and Jack then farmed the property as partners. In the early days there was a lot of clearing to be done. The partnership continued until George was killed in action. The partnership was then dissolved and George's wife, Elizabeth, sold her share to Lawrence and Nellie Barns. She then lived in Euroa in order to obtain employment for her children. This property was later bought by Joe Fay who also acquired Jack's share. It is all still retained by Joe's widow, Thelma and son Gary who live on the properties at Creighton's Creek. Other members of Joe and Thelma's family are Joseph and Denyce. Captain George Fay (left) and Tom Sharp in Egypt. The above article was extracted from the Euroa Gazette, p. 62. Elizabeth (Babs) had 6 children, five sons and one daughter and subsequently 20 grandchildren. Died aged 86 years, Melbourne, 22 November 1967. Elizabeth was a tall, slim woman, with a carriage described as stately. She never wore make-up, her hair was worn simply, in a tidy bun, her clothes were always clean and neat. A quite and unassuming woman who had a profound effect on all who met her; a remarkable woman. Elizabeth was an industrious woman as one would need to have been, being the eldest of 13 children growing up on a farm. Her early responsibilities and training throughout those years of caring for her mother and siblings, carried her steadfastly through the lives of so many people, until she died at the age of 86 years. A warm, caring woman, with a great inner strength, not to be a leader, but to be there by someone’s side; to see what needed to be done; what problem needed to be resolved. Capable always, she created order out of chaos, briskly yet quietly; her pace never seemed to falter. As a young woman she had a strong ambition to train as a nurse, but her family would not allow her to do so; their reasons are now unknown. Perhaps, the loss of such a capable young woman to the growing family would have been too great. Her cleaning, nursing and cooking skills would have been a great loss to her mother. At the age of eleven she was cooking not only for the expanding family but also the harvesters or whoever else came to the farm. Whatever the reason for their denial of her aspirations, she carried the disappointment throughout her life, although this was rarely mentioned. She was 22 years of age when she married George Fay at Longwood, Victoria. 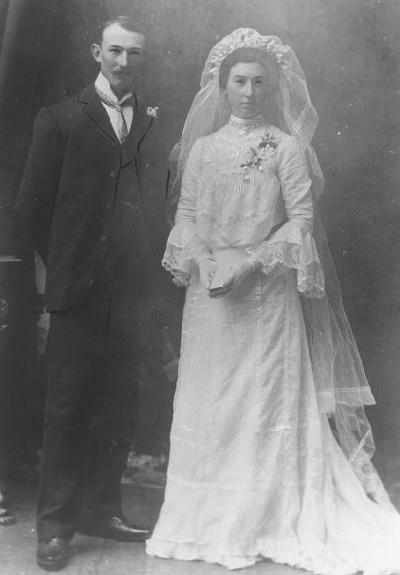 George Fay and Elizabeth Sharp on their wedding day, 13 May 1903. Her husband was the son of a soldier of the same name, who had been returning to Ireland from army duty in India. 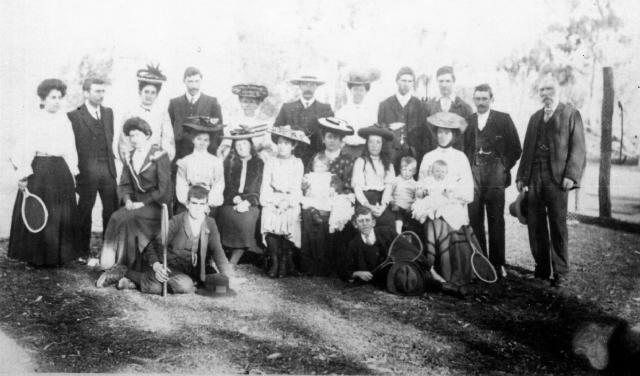 George Snr., and his friend (who’s sister he later married) visited Australia on their way home and had decided to stay. Later, he and his wife (Frances Wakeford) took up land at Creighton’s Creek in the early days of Soldier’s selection land, coming available. When Elizabeth and George married they built a home on his family’s property ‘Cluny Farm’ Creighton’s Creek, 10 miles out of Euroa, which is situated 160 kilometres from Melbourne via the Hume Highway. Her cooking skills were renowned, her flaky pastry to dream of, and her scones always took first place in shows. She was an excellent needle woman, a good horse woman and excellent driver. (Horse and Jig) In other words: A capable country woman. The local rifle range was situated on their property, where her husband and others trained. When World War 1 started he went to Melbourne to train the young men signing up. 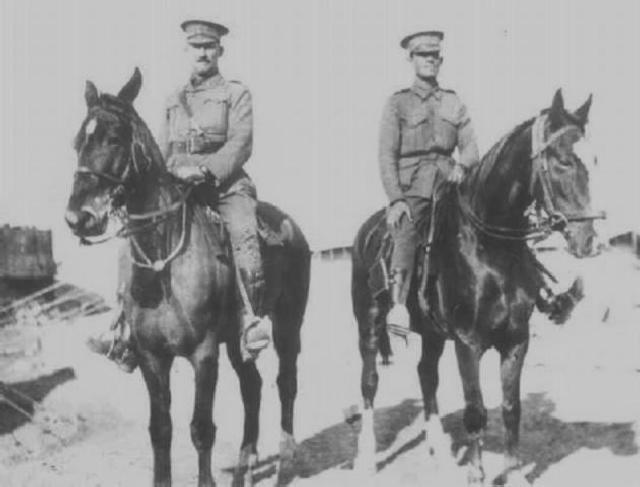 Perhaps it was, sending 16 & 17 year olds off to war with little experience, which eventually saw him make the difficult decision to leave, with his horse, for Egypt to join the 8th Australian Light horse. 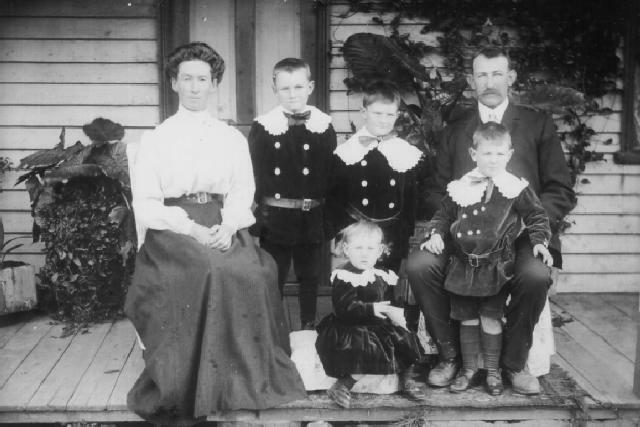 (Left to right) Elizabeth ("Bab"), Bernard, Harold, George Jnr (seated), and Edward between George Snr's legs. Navigating by the stars, he led his men through the inhospitable deserts of Africa, beneath which he was destined to remain, forever, with other fallen sons and fathers. 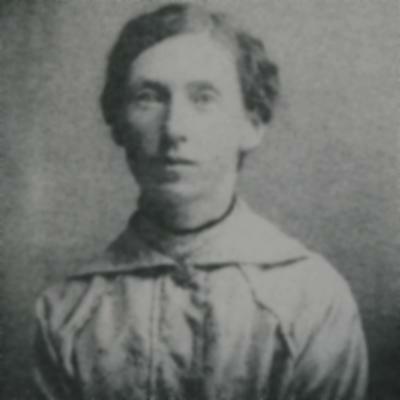 Elizabeth, with six children, the youngest newly born, had taken over the running of the farm, from which she also operated the local post office. She received constant flow of letters from a loving husband, a man with whom she always claimed, she had never had a cross word. 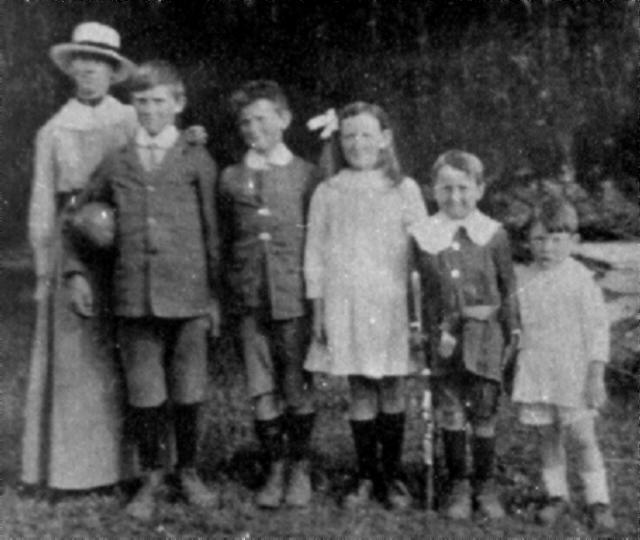 Elizabeth ("Bab") with five children, (left to right) Bernard, Harold, Laura, Edward, and George. Her husband was with the Light horse at El Burj Hills in Egypt, when she knew without any doubt, that he had died. She waited some time before the knock on the door came with conformation, and the day of his death, was as she knew it, 1 December 1917. Over time, so many of his men wrote to her, and others travelled great distances to see her and to talk of what he meant to them. It was well established that he was wounded, but refused to leave his men while he could still sit a horse, for which he paid the ultimate price. Did knowing this comfort her? We never thought to asked her, but knowing her, we do know, she would never have asked him to do otherwise. She continued, through the following 50 years to feel his presence close to her, supporting and loving her. This feeling was very real to her. She would not consider having another partner. 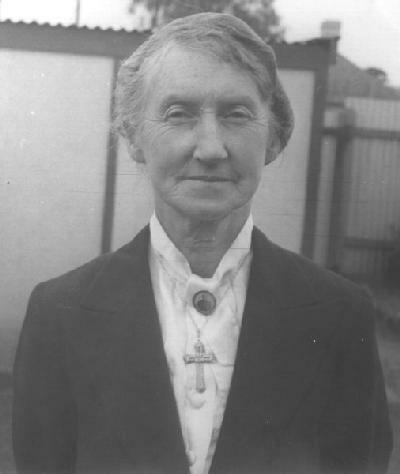 Elizabeth sold the farm and bought a house in Euroa in 1918 to be close to schooling and work for the older boys. Here she raised the children and worked with the local doctors, taking into her home women who needed to come into town when a birth was imminent. These women and their babies, stayed with her to recuperate after birthing, or operations, until they were strong enough to travel back to their homes. For so many of these hard working country women, it was the only rest they ever had. Elizabeth was a natural nurse and a woman with much common sense. Perhaps, one secret for her success in nursing her patients, her children and grandchildren, was her lifetime conviction of the necessity for cleanliness. Tables tops and floors were scrubbed, linen boiled and utensils sterilised. Fresh air, sunlight, clean water, fresh food and scrubbed hands for its preparation, were all considered essential to maintain good health. As the childre grew up to adulthood, the need to find work for them all saw her shift the family unit to West Coburg on the outskirts of Melbourne. Two of her sons became policemen. During the depression years, because she had two young sons working, she received no pension. Despite this she saw that no one she knew went hungry, including neighbours deserted by fathers, who left in search of work, or because they couldn’t cope through those dreadful years. Her home was always full of people, talking, laughing, eating. No doubt it was her cooking abilities which enabled her to feed so many hungry people. Certainly, living most of her life without access to shops would have resulted in her becoming quite resourceful. With the coming of the second World War, two of her sons joined up. Edward joined the RAAF and her youngest the AIF. George, named for his father, travelled and fought through the same areas of the Middle East as his father had, which appeared to his mother like an omen. Her fear he would not come back either, was something she had to live with till the end of that war. Return he did, and with photo’s of his fathers grave at Ramleh Grove Military Cemetery, in Palestine. 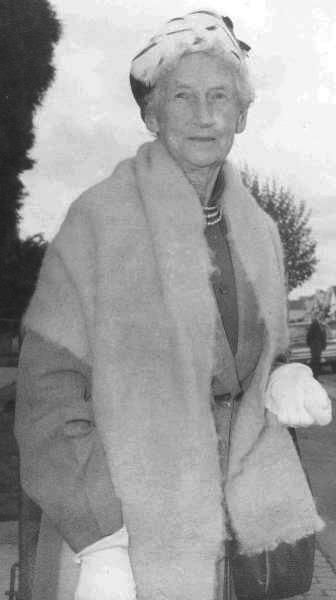 Elizabeth Fay in the 1960's. Elizabeth was always available to support anyone in need, and one particular case was a young neighbour who was sent home with new born twins, her first children, having been told they could not survive. Elizabeth nursed these babies, her faith never allowed her to be daunted when faced with the impossible, and survive they did, growing into strong healthy children. She sewed and mended and turned sheets with an small Singer sewing machine which was worked by hand. Her fingers flew, as they spun the handle on the side of that machine. She was always available when anyone was ill, work to be done, or when a whole family needed to move in with her. Christmas Days at her home with the ever increasing numbers of people were just wonderful. The old wood stove produced miracles and the gas stove needed to be used as well on those occasions. We seldom saw Grandma without an apron on, as she kept herself busy and always had a smile and warm welcome for anyone who came to her door. Her grandchildren’s most precious memories, are of the times when the old tan tin trunk was pulled out from under the bed, and one by one the feathers, materials, silk scarfs, presents and mementoes her husband had sent her from Egypt, were lifted out with much reverence. We knew the stories surrounding each one but waited, and were filled with awe as images of the mysterious East cast a spell. As they were placed back into the safety of the old tin trunk it was all over....till next time, but those precious memories of Grandma Fay, sharing her treasures and memories will last with us all forever. Her deeds we learned from others, we wonder what she could have told us had she been so inclined. We found, when people spoke of her it was not only with great respect but coupled with a warmth of feeling. Her step was firm and measured as she moved with great dignity through her life, and those of others. Nicolette Caggiati-Shortell for generously making available the Fay family records, including letters, photographs and newspaper clippings, and through her kind permission, these are published on this site. In a book written by Janet McCalman called Struggletown - Portrait of an Australian Working Class Community 1900-1965, (Melbourne 1984), the story of Richmond, a suburb located within the Melbourne metropolitan area, in one part of a chapter, she tells of the life faced by the ordinary Australians in response to the trials of the Great War. It makes compelling reading. Below is the extract. Oh, it was the pick of the country who went and all young men. And if you had false teeth you were no good; if you had glasses you were no good. It worried me to think that such fine and physically able and in character strong-so many to be killed, crippled, maimed. Somehow, £25 was raised for the Belgian Relief Fund. Being of German descent, I doubt if I did three years schooling of the eight I was supposed to do. The coming of the First World War changed everything as far as I was concerned and one thing I did learn was to defend myself. Even some of the teachers would come into the class and ask how your grandmother was in Germany-well we had no way of answering those sorts of questions. And kids would call you a 'dirty German' and one thing and another, and of course one would take a poke at you and another one would. So I carried the few books I'd need in those days and I had a wooden pencil case tied together with a long strap. Well if the kids got daring and there was more than I could handle, I'd swing the strap. And one kid, I cut his lip and knocked two teeth out. And his father came over to have a go at me but he didn't realize that my father was home and my father just picked him up over the front fence and said: 'If you come in here, you knock on the door like anybody else'. People who really knew us, they were damned sorry, but a lot of people were very bitter. My father had difficulty in getting local work. He used to go on the wharf, but being a naturalized subject, he couldn't continue working there, so he got a job in the Victorian Railways and he was working on the railway lines up round Bright and Rutherglen and he'd come home only occasionally. Tudor soon assumed the federal leadership of the Anti Conscription campaign. It helped that he was a teetotal Congregationalist, albeit one who had enraged militant Protestants in Richmond by supporting Irish Home Rule.33 But he also presided over a P.L.C. that was fighting for its life. The Richmond P.L.C. came late to the conscription debate because it was preoccupied with defending the integrity of the party against assaults on two fronts-from the Catholic Federation and the Drink interest. Parallel with the evolution of war politics in Richmond ran a story of sectarian tensions within the Labor Party and of conflict over the role of the state in the regulation of morals. The result was a highly complex reaction to the war and conscription: the formation of a broad non-sectarian alliance against conscription and a split within the Catholic community over State Aid to church schools and the nature and role of the Labor Party. Ted Sullivan, whose family were in the thick of these battles within the P.L.C., sees the seeds of the 1955 Split as being sown during World War I. Alliances and prejudices were formed then, that in the family dynasties of Richmond Labor politics were passed from generation to generation-and still endure. Richmond's parliamentary representatives are an enigma if not a conundrum. Tudor is a teetotaller who was present at the Liquor Trades' picnic. 'Gor Save' Webber now the M.L.A. for Abbotsford is also a teetotaller, but voted against six o'clock closing and Ted Cotter who will enjoy a drink with either a lord or a labourer voted for the Bill. Simultaneously in these early months of 1917, the Left critique of the war was strengthening. Dr Mannix's deprecation of the conflict as an 'ordinary trade war' earned him the respect and gratitude of Labor Call and the Victorian Socialist Party, and the continuing resentment of loyalist Protestants. If Mannix's stand drove away as many Protestant votes against conscription as it won from Catholics, then certainly in Richmond Tudor's Protestantism seems to have fortified the non-Catholic Anti cause. And Tudor shared some of Mannix's doubts about the moral justification for the war. Certainly recruiting in Richmond was becoming ever more difficult. People still turned out for recruitment meetings-three thousand packed the Cinema Theatre in Richmond in early February when a young girl broke down after reciting 'Kitchener's Call'. Yet few replied to the invitations sent to every eligible man in the suburb and only an old man and a handful of boys offered themselves that night.41 Recruitment meetings were by now no more than free theatre. A few days later Tudor spoke at a recruitment meeting at the Melbourne Town Hall. Of the war that two years before had been hailed as the means to a moral and religious regeneration of the nation, he now despaired. fruit meringues, amazons, spanish meringues, snow balls, Alexandrias, Othellos, Desdemonas, chocolate fingers, fan chousettes, Genoisse cakes, sponges, queens, halfmoons, Vienna pastry, assorted almond pastry, Pretoria shells, dice, macaroons, shortbread squares, French pastry ornamented in various shapes, pears and apples meringued, plain and fancy biscuits, assorted sponge fingers, plain seed and currant cake, ornamented French cakes-orange, nut, rose chocolate. golden jelly, champagne jelly, madeira jelly, Montpellier cream, charlotte russe, Italian cream, tutti-frutti, trifles en caramelle, fruit salads. passion fruit, vanilla, strawberry, Fresh fruits in season, dried fruits, nuts, confectionery. My brother came out from the city with the news and my father said, 'We'll ring the school bell', and of course people came out to see why it was ringing-it was about nine o'clock at night. So they marched around the streets and sang and got tins of boiled lollies and they scattered them round. Richmond's first war was over. 1. Richmond Guardian, 8 August 1914. 2. Ibid., 13 February 1915, 7 September 1918, 18 March 1916; Labor Call, 11 February 1915. 3. Richmond Guardian, 11 May 1918. 4. Ibid., 8 July 1916; Labor Call, 1 February 1917. 5. Richmond Guardian, 16 September 1916. 6. Royal Commission on High Prices, VPP, 1919 (v. 2), Final Report p. 6; Richmond Guardian, 6 January 1917, 10 July, 18 September 1915. 7. Richmond Guardian, 15 January 1915, 6 January 1917; George Johnston, My Brother Jack, (London, 1964). 8. Richmond Guardian, 23 January 1915, 6 January 1917. 9. Ibid., 4 April 1916. 10. Ibid., 23 January 1915. 11. Ibid., 8 January 1916. 12. Michael McKernan, The Australian People and the Great War (Melbourne, 1980), pp. 116-49; Richmond Guardian, 21 August 1915. 13. Richmond Guardian, 22, 29 August, 10 September 1914, 28 September 1918, 27 March 1915; McKernan, op. cit., pp. 14-42. 14. Richmond Guardian, 27, March 1915. 15. G. M. Dening, Xavier - A Centenary Portrait, (Melbourne, 1978), p. 109. 16. Richmond Guardian, 8 May, 17 July 1915. 17. Ibid., 17 October 1914, 15 May, 5, 19 June 1915. 18. Ibid., 13 March 1915, 3, 10 July, 16 October 1915, 29 January 1916. 19. Ibid., 2 February 1911, 27 May 1916, 6, 13 January 1917, 26 January, 2 February 1918. 20. Bill Gammage, The Broken Years (Melbourne, 1975), p. 14. 21. Richmond Guardian, 10 July 1915. 22. Ibid., 21 August 1915. 23. Ibid., 11 September 1915. 24. Ibid., 25 September 1915; McKernan, op. cit., pp. 98-105; Richmond Guardian, 9 October 1915. 25. Richmond Guardian, 30 October, 24 December 1915, 8 January 1916. 26. Ibid., 15 January 1916. 27. Ibid., 29 January, 12 February, 11 March 1916. 28. Ibid., 4 March, I S April, 6 May 1916. 29. Ibid., 20, 27 May 1916. 30. Ibid., 29 July 1916. 31. Ibid., 12, 19, 26 August 1916. 32. Ibid., 16 September 1916. 33. Ibid., 17 November 1906. 34. Ibid., 14 June 1913, 21, 28 November 1914, 1 May 1915, 9 September 1916; Celia Hamilton, 'Catholic Interests and the Labor Party, 1910-1916', Historical Studies, No. 33, November 1959, pp. 68-70. 35. Richmond Guardian, 23, 30 September, 14 October 1916. 36. Ibid., 14 October 1916. 37. Ibid., 4 November 1916. 38. Ibid., 6, 27 January, 3, 24 February 1917. 39. Ibid., 10 March 1917. 40. Ibid., 8 February 1917, 5 February 1916, 18 January 1919; Richmond Chronicle, 1 October 1943. 41. Labor Call, 8 February 1917; Richmond Guardian, 10 February 1917. 42. Labor Call, 15 February 1917. 43. Richmond Guardian, 28 April 1917. 44. Ibid., 12 May 1917. 45. Ibid., 9, 16 June, 25 August, 28 July, 29 September 1917. 46. Ibid., 24 November, 22 December 1917. 47. Ibid., 8 June 1918. 48. Ibid., 17 August 1918. 49. Ibid., 9, 16 November 1918. 50. Rose Saddler (pseudonym) spinster, interviewed with her brother Jim by author 29 January 1981. 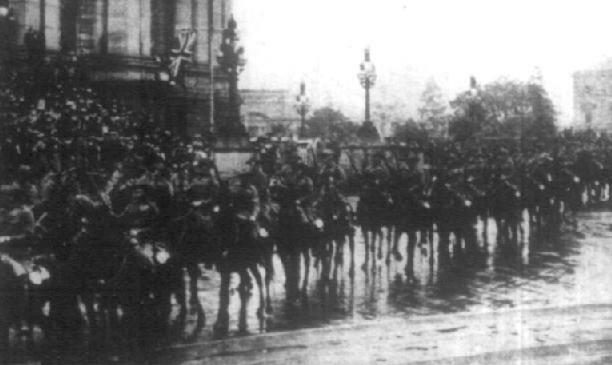 March past by the 4th Light Horse Regiment in Melbourne, 1914. March past by the 4th Light Horse Regiment. On 24 September 1914, the infantry and light horse formations training at Broadmeadows organised a march through Melbourne. Below is a picture of the 4th Light Horse Regiment, part of the the 1st Contingent, marching past the Federal Parliament building on a rain soaked Melbourne day. 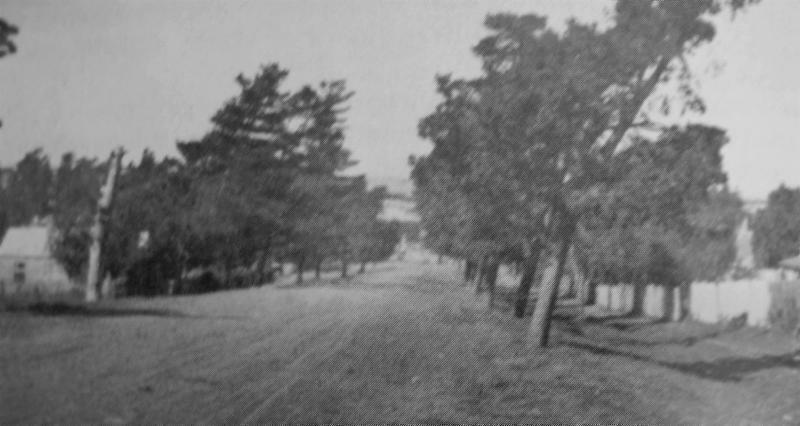 Fawkner Street, Broadmeadows looking downhill towards Moonee Ponds Creek, 1909. Broadmeadows was a failed development, often described as dead as Julius Ceasar. After 30 years of attempting to sell the name to the Melbourne public, it was still dead. 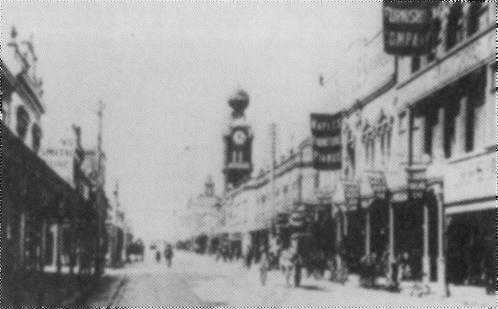 The picture, taken in the main street of Broadmeadows in 1909, tells the story. This is Fawkner Street in what is now called Westmeadows near Tullamarine Airport. The photographer is looking downhill towards Moonee Ponds Creek. The picture isn't skewed or anything like that even though it appears distorted. The reason is simple - trees are bent over as a consequence of the westerlies blowing across the plains. Frequent visitors arriving at the airport will have experienced the unwelcomed strength of these breezes as their aeroplane lands. It was no better then in 1909. No one ever thought the town to be a pleasant place to reside except by the hardy settler. Things changed with the outbreak of war in 1914. 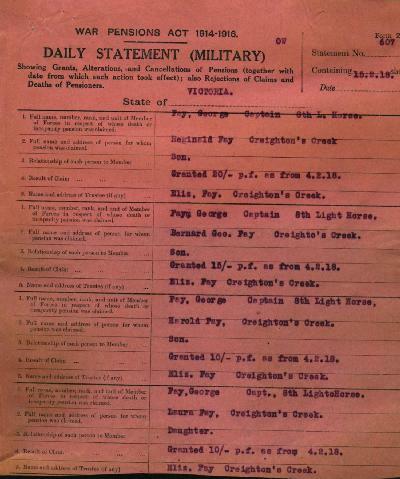 Three months of the war and the name was imortalised in the lexicon of Australian history. The developers could not hope for a better propaganda coup than that. Land sold quickly at inflated prices. The war was good for the land speculators at Broadmeadows.